A cross section through the heart reveals a ventricular aneurysm with a very thin wall at the arrow. Note how the aneurysm bulges out. The stasis in this aneurysm allows mural thrombus, which is present here, to form within the aneurysm. This patient underwent coronary artery bypass grafting with autogenous vein (saphenous vein) grafts. 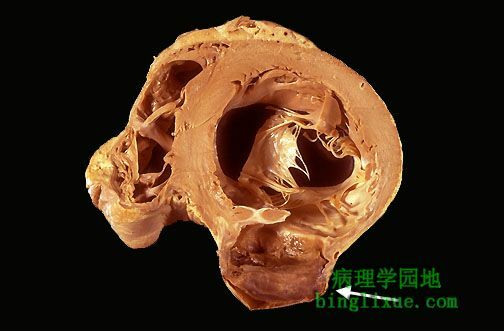 The largest of these runs down the center of the heart to anastomose with the left anterior descending artery distally. Another graft extends in a "Y" fashion just to the right of this to branches of the circumflex artery. A white temporary pacing wire extends from the mid left surface. There is a tear (arrow) located 7 cm above the aortic valve and proximal to the great vessels in this aorta with marked atherosclerosis. 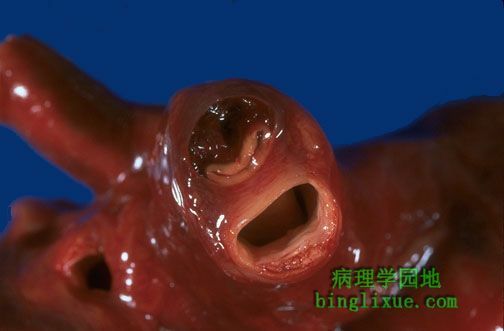 This is an aortic dissection. Microscopically, the tear (arrow) in this aorta extends through the media, but blood also dissects along the media (asterisk). An aortic dissection may lead to hemopericardium when blood dissects through the media proximally. 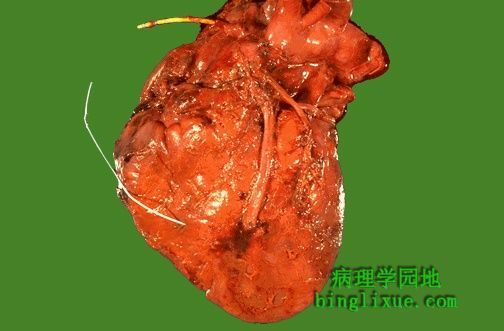 Such a massive amount of hemorrhage can lead to cardiac tamponade. This aorta has been opened longitudinally to reveal an area of fairly limited dissection that is organizing. 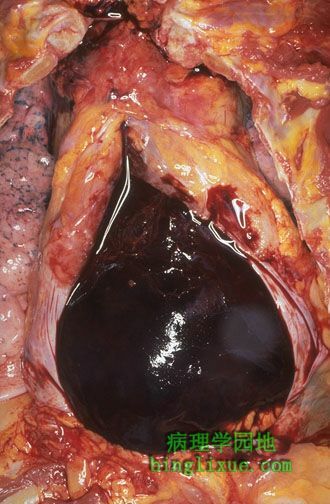 The red-brown thrombus can be seen in on both sides of the section as it extends around the aorta. The intimal tear would have been at the left. This creates a "double lumen" to the aorta. 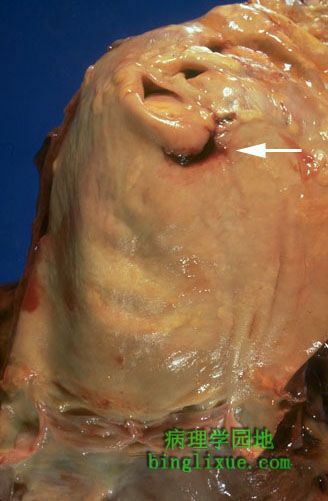 This aorta shows severe atherosclerosis which, along with cystic medial necrosis and hypertension, is a risk factor for dissection. Here, the dissection went into the muscular wall. In any case, an aortic dissection is an extreme emergency and can lead to death in a matter of minutes. The blood can dissect up or down the aorta. Blood dissecting up around the great vessels can close off the carotids. Blood can dissect down to the coronaries and shut them off. 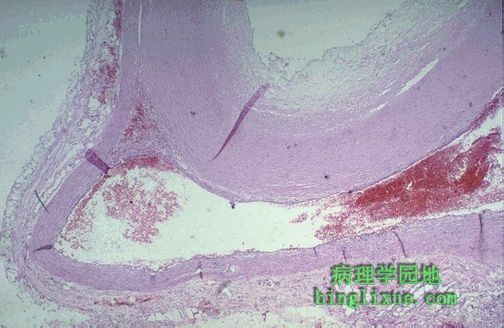 The right carotid artery is compressed by blood dissecting upward from a tear with aortic dissection. 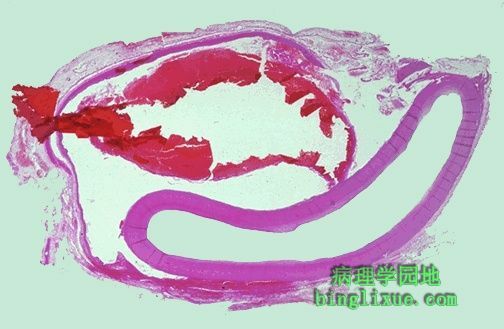 Blood may also dissect to coronary arteries. 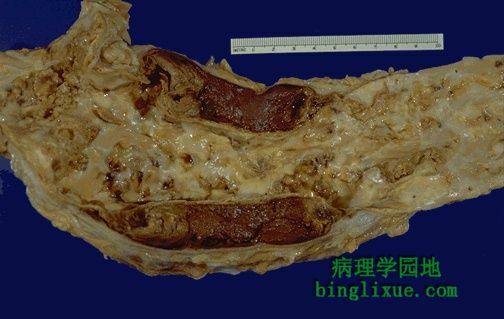 Thus patients with aortic dissection may have symptoms of severe chest pain (for distal dissection) or may present with findings that suggest a stroke (with carotid dissection) or myocardial ischemia (with coronary dissection). 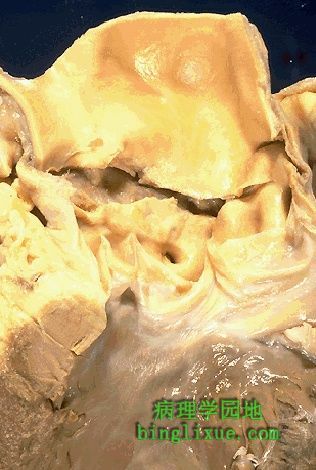 This aortic dissection occurred just above the aortic root in a patient with Marfan's syndrome. The tear extends across the aorta. Hemopericardium with tamponade occurred within minutes of this event.